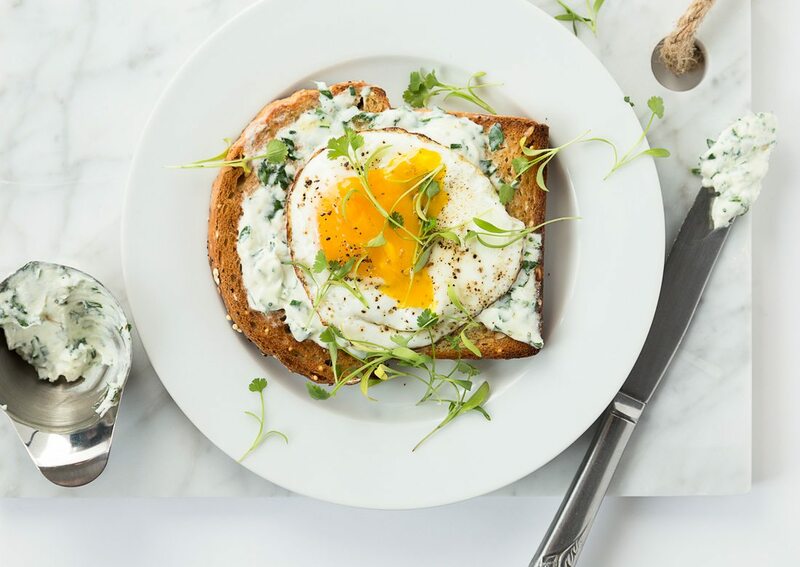 Make yourself the carby, cheesy breakfast you deserve with Terrell Creek Farm goat cheese, a chive-and-dill cream cheese spread, and farm-fresh eggs. In a small bowl, combine goat cheese, cream, dill, chives and parsley. Using a fork, alternate between mashing the mixture with the back of the fork and whipping it, as you would when making scrambled eggs. Once mixture is fully combined, it will have a cream cheese–like texture. Set aside. Heat a large nonstick skillet over medium-high heat. Meanwhile, pop two slices (assuming you can only toast two at a time) of bread into the toaster. Toast to preference. Once skillet is heated, pour in a healthy guzzle of olive oil (about a tablespoon) and swirl to coat. Crack eggs in the pan, being careful to not break the yolks. Sprinkle with salt and pepper. Let cook until whites have begun to set and edges are crispy, 1 to 2 minutes. Cover with lid and turn off heat. Let steam until whites are fully set, about three minutes. While eggs steam, toast remaining bread and smear a quarter of the goat cheese mixture onto each slice. Remove eggs from pan using a thin spatula and place one egg atop each piece. Top each slice with a handful of microgreens before serving.